I have a problem with Tenfourfox, I have a Powe Mac G5, 2 CPU 2Ghz, 1GB RAM, with OS X 10.4.11. Since a few days ago youtube does not let me see the videos. 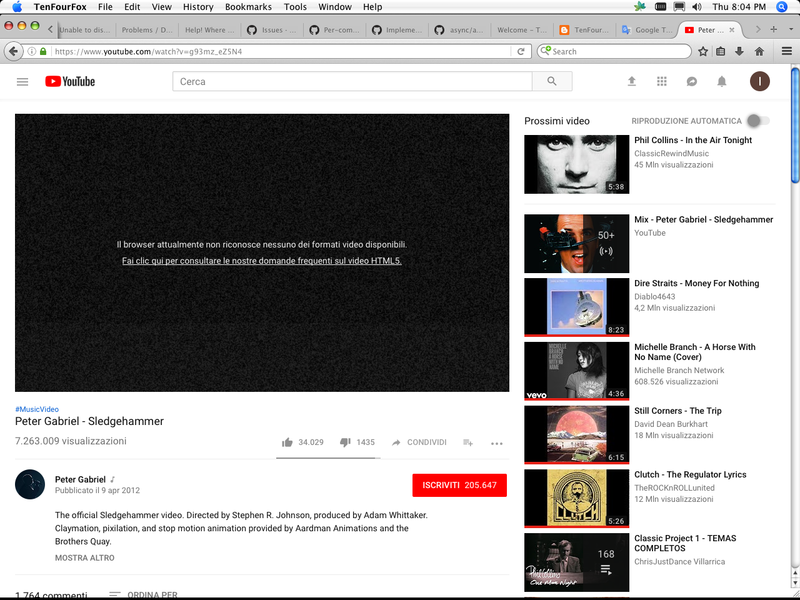 The black screen appears on the screen with a message "the browser does not currently recognize any of the available video formats". I've tried various versions of Tenfourfox but the problem remains. Please help me, this problem suddenly appeared. YouTube seems to have removed VP8 support for a lot of old videos (or: our VP8 implementation is somehow broken?) – the solution for now is: Go to Preferences>TenFourFox, then turn on VP9 support by checking "Enable MSE/media quality options (slower, if available)"
Thank you so much for your help, with this option now it goes. so is it a problem that has come to everyone in these days? will it be solved? Your browser does not currently recognize any of the video formats available. Click for questions about HTML5 video. As a kinda strange workaround, if I click on a random video in the right-hand scrolling window and let it play for a few moments, I can get the original video to play by clicking TenFourFox's back-button. It unfortunately doesn't work for all videos. It also looks like... Enable MSE/media quality options (slower, if available) is not available in TenFourFox 38.9.0 preferences! Chris Pederick's User Agent Switcher 0.7.3 has no effect. Greg, 38.9.0 does not support MSE. You'll have to update. It does indeed simply look like MSE is now a requirement, so this will be preffed on by default in FPR10 (it can still be turned off if users require it). Preliminary: Buffering and Youtube's choice of auto speed is a bit sketchy. Thank you for all your hard work, it's very much appreciated. Talk in a few days. I've gotten the same problem and MSE works, but it's too slow to listen to music; it keeps pausing with the rotating circle, even after the gray line at the bottom seems to indicate that it's loaded all the way. Without MSE yputube claims that my browser (10.4 fox 7450, downloaded yesterdat) doesn't support html5. Why? Hello, guys. Taking advantage of the space of this post, I come to ask a question: Is it possible to watch hangouts live on YouTube? I own a PowerBook G4 with OS X 10.4.11 and Power PC 1.5 Ghz processor with 1GB of memory. I have already installed two plugin programs - Perian and AVC1 Decoder and nothing. About recorded videos, I can watch them normally. 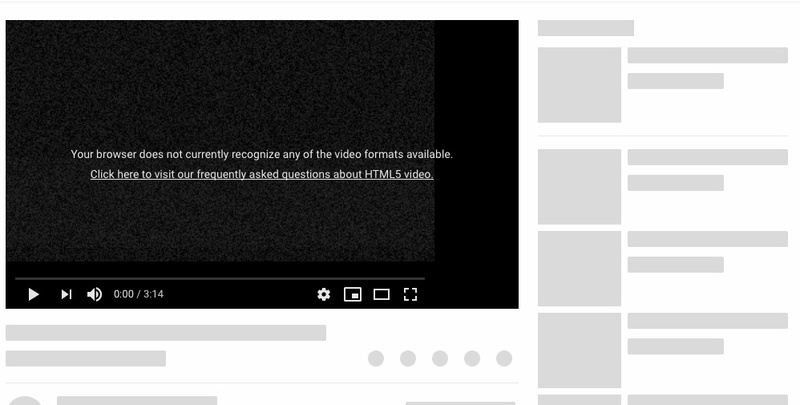 On the HTML5 YouTube page, the only bugs it shows that are not installed are H.264 and MSE & H.264. Thanks in advance for your feedback. Rafaelrosa81, if hangouts require H.264 (even though I wasn't able to confirm this on any Google help page) you're out of luck. Perian and other QT plugins work in QuickTime Player, but not in TenFourFox. The only chance I see for PPC users is to update to 10.5, install Safari with Leopard Webkit (which has H.264/MP4 hardware support) and try if it works. Cameron, while checking this I noticed that Safari 5/LWP doesn't support MSE but still plays H.264 videos. Dear Chris, thank you so much for your help solving this YouTube problem. BTW, is it recommended to keep the checkbox "Enable MSE/media quality options (slower, if available)" always checked, not only for YT? Joachim, you can keep it checked, it's likely to become checked by default in the next browser update anyway. Yes, it will be the default in FPR10. I've searched TenFourFox preferences and have no "enable Optionsw" as mentioned. I also tried to find an upgrade to my version of tenFour Fox and struck out. I used Terminal to determine my processor and successfully upgraded. desk top links and all such links to music videos ceased. delays (spinning pinwheel) in other programs like this email . . .
and also I should do some maintenance like repairing permissions. Well it worked for a bit to play a few Youtube music videos, but not anymore. now, whereas they weren't before. I used to be able to click on any of those links and have the music video play. forum said to turn on. My processor in this G4 eMac is a 7450. Please post a link to one of your videos and also a screenshot of the browser playing the video. I'm thinking that the version I downloaded, was the same as what I had. This one I downloaded that worked for a short while today is 38.5.0. . . . but after selection my CPU type, this is what the recommended download was and so I went for it. I'll try the "latest version" link above that you posted. is sitting in my "Downloads" folder, but the old version 38.5.0 is still there in Applications. I got rid of the old version application ICON in my dock in favor of the new, but it has reverted to continuing to use the old Version 38.x. sitting in Applications. Drag the old version 38.x out of Applications to TRAsH and drag version 45..x into Applications in its place . . . . or do I need to do an "Uninstall"? -> That's exacly what you need to do. That's what i did while waiting for an answer. Dragged and buried the old version in a Storage folder first, and put the new version into Applications. Well tube music videos play and so do Tube movies now, but video loading and browser speed is woefully slow; it's like back in the days of OS 8. The previous TFF was actually playing all videos faster but music videos ceased to function. What are the memory requirements of TFF? I do know I need to max out the RAM on this old 1.5 GB eMac. I'm ashamed to say I only have a measly 768 MB of Ram. Any tips on how to speed up the frames per second and the speed of loading a page? Please note that because of the age of 38.x and the later features it didn't support, substantial portions of pages probably weren't even executing or enabled. My pages WERE fully loading with the older 38 version. My first attempt to load a YouTube page today, yielded the black screen-no support pane and everything on the page was in grey blocks. Here's a snap. MSE Preference just needed to be selected. Pages fully loading again. Hi, hijacking this thread as it describes the same problem I have, except I have already done everything suggested here. I use a G5 Quad with 8GB RAM, but for some time I started having the same YouTube issue as the others. Except I updated TFF just today (FPR12, dated 2019 in the "About TenFourFox"), and I see "Enable MSE/media quality options (slower, if available)" was already and still is checked. Unchecking and rechecking it had no effect. I`m using the G5-dedicated version. I have this playback problem no matter what GPU is inserted (GeForce 6600, Quadro and even a flashed X1950XTX 256MB), and this happens in the latest version of Tiger, Server Tiger PPC & Universal, Leopard and Server Leopard. Thank you everyone in advance! I really have been appreciating everyday these past few years all the work that has been done and is still done in TenFourFox! Long live PowerPC!!!! Turok, a few example URLs of YT videos that don't work for you would be helpful. Hi Chris, sorry for the delay. Every single video I have tested did not work on YouTube, except... just to meet your request, I turned on my G5 today and started trying out the EXACT same videos, without touching ANY configuration, and they all started working! Why? Now every video works, without me having done a single hardware or software modification, or even a single modification to my router, internet connection etc..
Would you happen to have a good guess as to why that is so? I did not even change external devices like HDDs, keyboards or mice... This is the first time I turned on my G5 since that day I posted here. I didn't update TenFourFox, either. Nor install/uninstall anything. I have no explanation for this, either. May have been a cache issue in Mac OS X or the browser. Your router may have a different IP address by now. If it ever happens again we may have a chance to see a pattern.